One of two experimental films directed by Arakawa, For Example (A Critique of Never), 1971, closely follows its protagonist, a homeless boy, as he wanders the streets of downtown New York City. Shot in a documentary style, the camera observes every step of his examination of the constantly shifting relationship between his body and its surroundings. At the time of production, Arakawa and Madeline Gins were deeply engaged in research on the workings of the mind and the body in the process of perceiving the world. The film premiered at the Whitney Museum of American Art in 1972. Arakawa’s film from the context of the late 1960s – 1970s experimental film scene. For this event, Lampert will curate a selection of films from the 1950’s – to present day, which incorporate or work heavily influenced by the experimental music world, and will host a post-screening Q+A. 1964, 11 minutes, 16mm, color, sound. Courtesy of Canyon Cinema. 2013, 10 minutes, 16mm, color, sound. Music by Tashi Wada featuring cellists Charles Curtis and Judith Hamann. Courtesy of Canyon Cinema. 1989, 10 minutes, 16mm, color, sound. Featuring vocals by Shelley Hirsch. Courtesy of Canyon Cinema. VERTICAL AIR1996, 28 minutes, 16mm, black and white, sound. Score composed and performed by Wadada Leo Smith. Aperture and Der Greif invite you to a Variety Show hosted by Jason Fulford, guest editor of Der Greif Issue #11. Robert Fitterman, Lawrence Giffin, Holly Melgard and Andrew Lampert will perform from Rob’s Word Shop (UDP, 2019) and re-stage an improvised transaction of words and letters based on Fitterman’s durational performance work. Saturday, February 23 from 3–5 PM, MoMA PS1 Book Space Presents a conversation between Tosh Berman and Andrew Lampert in Celebration of TOSH: GROWING UP IN WALLACE BERMAN'S WORLD, published by City Lights. Book signing to follow! Four Scores (From Zero to Nothing). An introduction and conversation with Marie Losier on the occasion of her massivemid-career retrospective at the Museum of Modern Art in NYC. AS OPPOSED TO GRAVITY, a “contracted cinema” performance created in response to the exhibit TITLE by Jeff Preiss. I'm not trying to be mysterious, it's just that what I'll do is speculative until it happens. A plan exists, but the reality of things is that I can't entirely predict the outcome, or how it will be experienced by those of us in the gallery, since we are all in it together. I'm committed to not knowing too much in advance about the results of my ideas. In lieu of a better description, I might mention that As Opposed To Gravity is site-specific and made in direct response to your installation. In fact it includes your footage, which will be projected on 16mm. Your exhibit is concerned with the loop, the circle, the perimeter, and what I'm thinking to do focuses on the center, the space between. I'll be in the middle. That's all I can really think of to say other than that I'll probably never do this piece again after the 3A show. Maybe that is what we should be telling people. 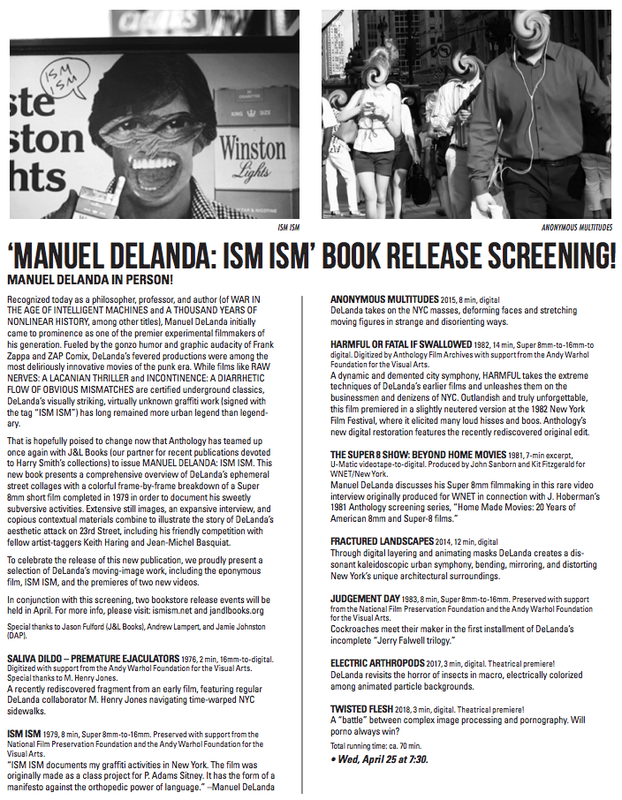 A screening and book launch event at Anthology Film Archives to celebrate the release of MANUEL DELANDA: ISM ISM on J&L Books. A Midwest mini-tour with C. Spencer Yeh: Two solo sets and a collaborative performance. An unparalleled animator, gifted painter, and notable musicologist, Harry Smith (1923–1991) was an underground renaissance figure bar none. Smith’s kaleidoscopic experimental films have influenced generations of wide-eyed enthusiasts, and his landmark six LP compilation The Anthology of American Folk Music (1952) laid the foundation for the folk music revival of the late ‘50s and ‘60s. Today, Smith is renowned not only for his dazzlingly ecstatic and eccentric works but also for the vast assortments of curious objects that he voraciously collected throughout his colorful life. Anthology Film Archives and J&L Books recently joined together to issue two new publications focused on Smith’s most unusual collections, Paper Airplanes: The Collections of Harry Smith, Catalogue Raisonné, Vol. 2 and String Figures: The Collections of Harry Smith, Catalogue Raisonné, Vol. 2. Each book features new essays and richly detailed photographic documentation of Smith’s decidedly eclectic assembling and research obsessions. To celebrate the release of these publications we present a program of newly preserved films alongside some very rare Harry Smith audio-visual surprises. US, 1946-57/assembled ca. 1964, 16mm-to-35mm, 23 min. Restored by Anthology Film Archives and The Film Foundation with funding provided by the George Lucas Family Foundation. A premiere of a brand new 35mm print of Smith’s landmark compilation Early Abstractions. This brilliant new print was made by doing an optical blow-up from Smith’s original 16mm master. You have never seen this classic work with such vivid color and detail. US, 1950, 16mm, silent, anaglyph 3-D 1.5 minutes. New print by Anthology Film Archives. Smith’s shortest film abstraction is also his only known attempt to work in 3-D. US, 1965-66, 16mm, silent 10 minutes. Preserved by Anthology Film Archives. In this film, Smith animates his extensive collection of Seminole patchwork. US, 1980, 35mm, 12.5 min. Completed over 15 years after the footage was shot and almost never publicly presented, Film No. 19 contains further outtakes from Smith’s abandoned Wizard of Oz adaptation. Made directly from Smith’s workprint, these captivating fragments offer a small taste of the masterpiece that Smith never finished. @ MoMA, Celeste Bartos Theater, 4 W. 54 St.
On March 10, 2017 Andrew Lampert and Public Opinion Laboratory will unveil the project Faked/Out, a multi-platform response to the world’s current information crises. Now that fake news is an all too real concern, it would seem that the only way to fight fire is with gasoline. Or, stated another way, the best way to understand fake news is to report it. With this in mind, Public Opinion Laboratory and Lampert will convert Recess into an office and operational hub for Fake Out News Incorporated (FONI), a news service very much concocted for the present moment. FONI staff and contributors will include: Brian Belovorac, Sean Berman, Dawn Cerny, Howie Chen, Whitney Claflin, Caroline Golum, Rin Johnson, Owen Kline, Carolyn Lazard, JoJo Li, Dave Miko, Nour Mourbak, Steve Paladinsky, Scott Ponik, Sara Greenberger Rafferty, Jordan Rathus, Edward Steck, and Angie Waller. I reprised my projectionist role at Tate Modern on January 18, 2017 in a performance of Tony Conrad's FIFTY FIVE YEARS ALIVE ON THE INFINITE PLAIN. Rhys Chatham (long string instrument), Angaharad Davies (violin) and Dominic Lash (electric bass) accompanied a recording of Tony Conrad's violin as recorded by Jim O'Rourke at an earlier performance. Over the course of 90 minutes four 16mm projections slowly, almost imperceptibly merge into one overlapping image. Focus shifts and other occurrences happen along the way. Okkyung Lee and I performed an untitled one-time only piece at Festival Aural in Mexico City on November 30, 2016 at the invitation of Blank Forms. Our show inlcuded a conversation about boy bands, visits to the Far East, a cameo gchat appearance from C. Spencer Yeh, and much more. 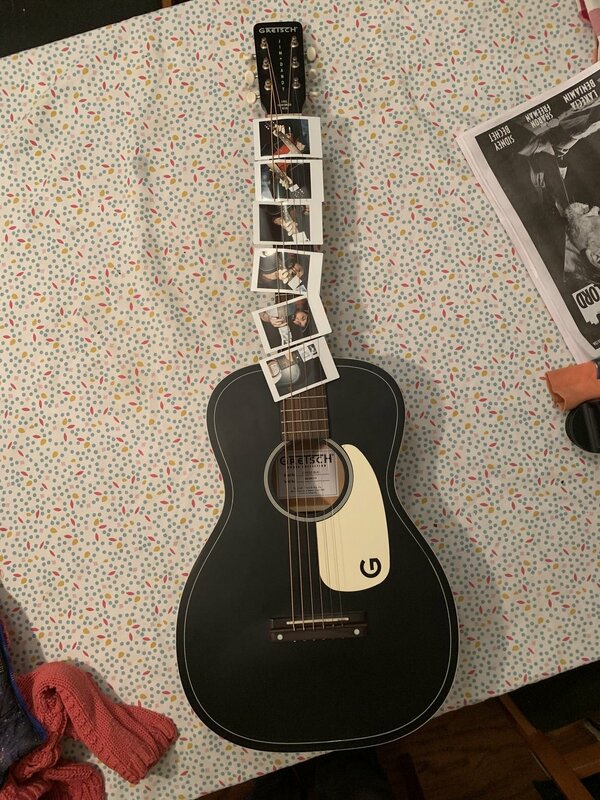 There was a little music and a lot of everything else.